Beat the eggs with the sugar and flour. 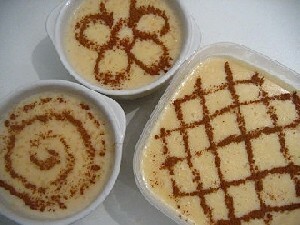 Mix in the lemon peel, cinnamon and milk gradually. Put it in the hot oven, always in glazed earthenware pot; bake for about an hour until it sets and gains a golden colour. Cook the beans as usual. Cook the sprouts. Break the Maize bread into small pieces. In a bowl place the beans, maize bread and the sprouts in successive and alternated layers, the first layer should be the beans and the last layer should be the sprouts. Put the olive oil with garlic in medium heat then, when it’s boiling, pour it on the miga. Serve immediately, accompanied with roasted sausage. 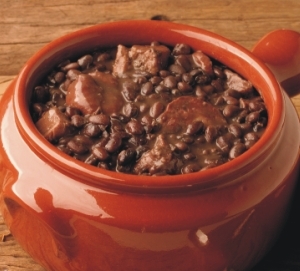 *The beans should be thoroughly cooked and place in bowl poorly drained. Boil the milk with lemon peel. Meanwhile, put a pot on the stove with 1 dl of water and when it starts to boil add the rice; let it cook for about 4 to 5 minutes. Start adding and stirring the milk, little by little, when it’s the rice is half-cooked. This operation takes about an hour. Mix the sugar and let it simmer a little longer. Pour it into serving dishes and sprinkle it with cinnamon. 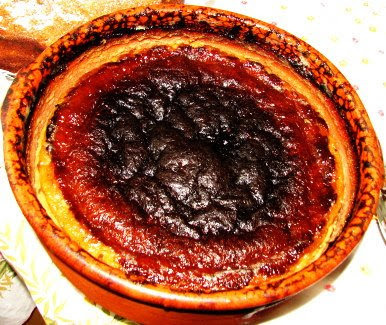 The arroz doce in the region of Coimbra was used as participation of marriage and grounds for the presentation of the groom. Girls of the people, along with her mother and boyfriend, visited the families they knew, who offered a bowl of arroz doce in a basket covered with a cloth made in handloom - Almalaguês cloth (flax cloth). Eight days later they returned to check the dish and receive their gift. First clean and cut up the goat meat, place the wine, peeled and beaten garlic, the laurel, malagueta pepper, salt and pepper and let it rest one day. Place it in a pressure cooker along with the fat during 1:30 to 2 hours, then place it in a clay pot or stainless steel (if you don’t have any clay pot) and let it establish until serving. Accompany it with sprouts or other stewed green vegetable and with baked potatoes or fries. 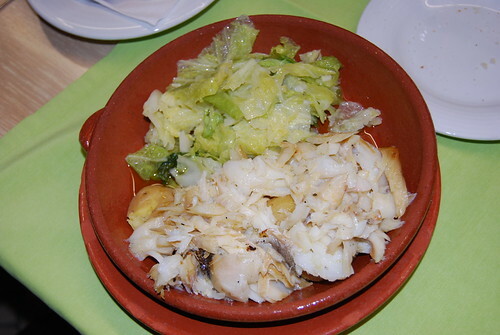 Dish of the region of Lousã, widely used in holidays and weddings. Therefore, it is also commonly known as "flesh of marriage." Cook the potatoes, the cod and the cabbage eyes already seasoned with salt, preferably in the boiler of the mill of the olive oil being careful to cover. In the middle of cooking put a bit of olive oil and cover it again. When all of it is boiled, put it in a bowl of glazed clay, watering thoroughly with the oil taken from the woodwork with their own measures. Accompany it with corn bread and homemade wine. This dish is made in the winter period when the mills are operating. Everyone eats in the same bowl or on individual plates, in which the miller is the first to one to serve since they were the ones who made the meal. And that’s how they would spent a nice evening among friends. Peel and chop the onions and the garlic cloves. Saute both in olive oil and add the meat. Add the carrots, sausage and linguiça and cut into slices and also add bacon strips; saute slowly. Add the chopped tomatoes, skinned and seeded, and involve all then cool it with red wine, reduce (to decrease the amount of sauce put it in a boiling container uncovered) until the alcohol evaporates. Then, cover it with water, season it and cook it for 6 minutes. Add the cabbage, cut into chunks. Cover the pan and cook for 15 minutes. Add the beans and boil for 2 minutes, to correct the seasonings and then serve. Thoroughly clean and arrange the stomachs (wash them impeccably, scrape it and then scald them). Then cut them into squares, in it’s the center add a bit of bacon and a mint leaf. Engage some form bundles and attach them with a thick line (also called Negalhos). 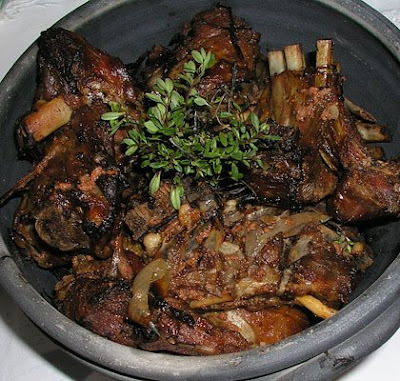 Place the Negalhos in a clay pot with the onion, laurel leaves in pieces, cloves of India, olive oil, red wine, water, garlic cloves, salt and pepper. Cover it and put it in the oven for 3 hours. Turn the oven to 170 º C. Beat the sugar with 150g of softened butter and add the eggs one by one. Add the nuts and liquor, stirring constantly. Then, add, 300g flour, sifted with baking powder. Grease a form with the remaining butter, sprinkle it with the remaining flour and fill it with the preparation. Put the cake in the oven, preheated, and bake for about 50 minutes. Then let it cool before unmold. Boil water with sugar, until the point of wire. Remove from it from the heat and add the yolks, mixing them with a fork. Bring back to simmer, stirring, to cook the egg yolks, but don’t let it boil. Add the liquor and stir. Let it cool down and fill the cake with the cream. Get both sides one above the other and cover it with the rest of the cream.